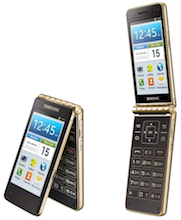 Samsung launches Galaxy Golden flip phone for Rs 51,900; is it worth a buy? After unveiling the same earlier this year, Samsung Electronics has launched Galaxy Golden â€“ a premium flip phone with a golden coloured accent â€“ in the Indian market. The phone sports dual screens (one on the inside and the other one on its flap) and provides users with a touch and type smartphone experience. While the outer screen enables the users to make and receive calls, flipping the phone open brings up the inner screen and a 3x4 keypad. While the company has priced the device at Rs 51,900, it is available for purchase online for as low as Rs 49,900. Here is a look at its specifications. The smartphone sports a 3.7 inch Super AMOLED capacitive touchscreen display (480Ã—800 pixel resolution) with 252 ppi pixel density, and runs on the Android 4.2 Jelly Bean operating system. In addition, on its exterior (since it is a flip phone), the device has a 3.5 inch Super AMOLED capacitive touchscreen display (480Ã—800 pixel resolution). The device is powered by a 1.7 GHz dual-core Qualcomm Snapdragon 400 processor, and has 1.5GB of RAM. The internal memory of the device is 16GB, which can be further expanded an additional 64GB with a microSD card. Galaxy Golden has an 8 megapixel auto-focus rear camera with LED Flash that can record full high definition videos (1080p) at 30 frames per second, and a 1.9 MP front facing camera for video calling. On the connectivity front, the device has Bluetooth 4.0, Wi-Fi (with Wi-Fi hotspot), 3G, and it also comes with a microSD card slot and a microUSB port. The dimensions of the device are 118mm x 59.5mm x 15.8mm, and its weight is 179gm. The company has provided a 1,820 mAh battery in the device. It has GPS (with A-GPS support), FM radio with RDS, and will be available in black and gold colours. The device also comes with 'Easy Mode', which comes with large fonts and icons and enables the users to access and search apps quickly. It also highlights certain features on the device like favourite apps and easy settings, which makes it simpler to use the phone. Another feature is the 'Hidden Receiver' that allows users to take calls without opening the folder and provides high quality sound in noisy areas, according to the company. While the specifications of the device are decent, they are no where decent enough to command an almost Rs 50,000 price. We feel that only consumers with very deep pockets, and a die-hard passion (with especial stress on die-hard) for flip phones will opt for this. Otherwise why would anyone spend so much on a flip phone with decent specifications when in the same pricing, you can get your hands on smartphones with awesome specifications like HTC One (Rs 48,999), Samsung Galaxy Note 3 (Rs 46,899), Nokia Lumia 1020 (Rs 47,222), and the soon to be launched iPhone 5s and 5c.